A couple days ago I touched on the fact that keeping you from prayer is a high priority of the enemy. Sometimes, like the other day, that looks like attacks, but a lot of times it just looks like every day blockades, valid reasons, or excuses. We all have things that make our Christian walk hard, we all have things that make having an active, healthy prayer life hard. I could talk about why it's hard to find time, how I'm not a morning person and so getting up early to pray is a physical difficultly. Or how I have two little ones who are still in the throes of the WE-NEED-YOU-EVERY-MINUTE stage (I'm told this ends). Or how I go to bed so exhausted I actually can't remember what day it is. I could say "I don't know when in there I'm supposed to find the time to pray!!!" A lot of that is valid, some of it is excuses, but none of it is my issue. For me it's a blockade, a character issue. Prayer is hard for me because I am a control freak. I feel like "control freak" is a super aggressive way to say it, I prefer to say that I'm a planner. And I should point out that this extends only to me. To pray about myself and my stuff is to place all my baggage in God's hands and trust Him to deal with it. On whatever His timeline is. Even if it's slow. Like, really slow. Because I'm scared to hand over the planning process I often just don't pray for my own things. I pray for my kids and I pray for my friends and my husband and my family and then I say "Amen" and open my eyes and go on my way. But ignoring the issue does nothing to remedy it. And worse, not lifting things up in prayer just because I have a struggle in doing it is downright disobedient. Not just because the Bible instructs us to pray but because to pull back on a spiritual discipline is to refuse to grow. 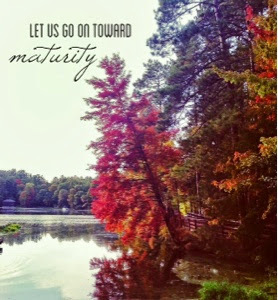 In Hebrews is says to "press on to maturity" (6:1), and not to stay at the beginning level of faith that we enter into. This is a call to growth. There's always going to be something. There's always going to be a blockade or valid reason or an excuse. And working through those things is going to be hard, and usually a little painful. Because growth always creates growing pains. If you can't feel yourself being stretched, if you're not outside your comfort zone, if you're not addressing what's hard, you need to ask yourself "am I growing?". I'm working on my blockade. It's hard and I'm not going to lie, it feels like a long process...like...really long. But I want a healthy, vibrant prayer life, so I will continue to step outside my comfort zone and work on the hard parts.